Get butter to sizzling over high heat in a large saucepan/skillet. Add in onion and garlic, stirring occasionally, and continue cooking until onion is just starting to become transparent. Add in ground beef & salt/pepper to taste. Brown the beef almost entirely, until just slightly pink in center, while breaking into small chunks. Add chili seasoning to meat/onion mixture (no other liquid) and stir until well combined. Continue cooking until meat is cooked through while breaking into smaller chunks. Meanwhile, combine the following ingredients into your LARGE crock pot and turn on heat. When meat mixture is done, add it to the bean mixture in the crock pot. Cook on LOW for 5 hours or on HIGH for 3 hours. We serve the chili over fritos and topped with cheese for a nice Frito Pie or just over plain rice, but always with cheese on top. We are a cheese-loving family, so that is not optional. Combine in slow cooker and heat on low for 4-6 hours. 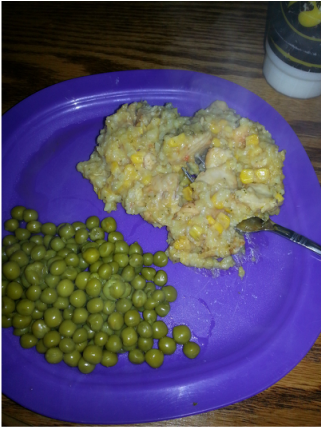 Cheesy Chicken & Rice Casserole - in Your Slow Cooker! Step 1. Put all the chicken pieces in the bottom of the slow cooker. Add the seasonings on top. Mix it all up well. Step 2. Dump the corn in. Pour in the entire contents of the rice sides packet. Then add in the cheddar cheese soup and the cream of chicken soup. Step 3. Now mix all of it up well. Cook on low for 5-6 hours or on high for 2-3 hours, stirring every 2 hours from bottom, until chicken is cooked through and rice is cooked properly. Step 1: Brown the ground beef with the onion, garlic, and seasoning (season salt, salt, pepper) to taste. I prefer not to drain it so that later it keeps better flavor in the "soup," but if you drain it or have a lean cut of beef you can add extra water. Step 2: Once the beef is completely cooked through (and drained if you are going to), add in the canned tomato products and the celery salt, basil, and any extra seasonings you may wish to add in. If you like a kick, you could add in a dash of red pepper flake at this point. Step 3: Once you have added in the tomato products, give it a good stir and let it simmer for about 15 minutes to let the flavors soak in while you shred the mozzarella if you are a procrastinator like me or, like me, you had a bunch of munchkins running around your ankles whining at the time, occupying your thoughts and you hadn't gotten that far, yet. If you have already shredded the cheese, go get a drink and let the sauce bubble a few minutes while you break up the noodles. Step 4: See.. Told you to break up those darn noodles... It is easier to eat the soup if you have them broken in advance since soup tends to be eaten with a spoon and spoons don't normally cut very well.. Break up the noodles and place at the bottom of your slow cooker. Then top with a layer of your sauce mixture that should be nice and hot by now. Step 5: I didn't get a picture of the cheese mixture, but mix all of the cheeses together in a medium/large bowl (mozzarella, Italian blend, cottage cheese, etc). Mix it up as best you can. Spoon that over the sauce mixture. You want to use about 1/3 of it on each layer unless you are doing really thin layers, but I am normally always able to get 3 layers in my large slow cooker. Then repeat the layer process again and again until you are all out of the food! 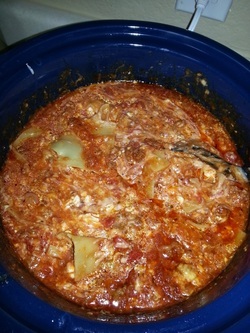 Step 6: The end result before closing your slow cooker should look like the picture above, with cheese on top. Just cover and cook. If you are using oven ready noodles, you can cook on high for 2-3 hours before eating (really it is done in about 2) or on low for 4-5 hours. If you are using regular noodles, cook on high for 5 hours or on low for 6-8 hours.